Egyptian activists shout slogans against President Abdel Fattah al-Sisi and his government, during a demonstration protesting the government’s decision to transfer two Red Sea islands to Saudi Arabia, in front of the Press Syndicate Cairo, Egypt, April 15, 2016. Egypt’s Press Syndicate announced on Tuesday its decision to file a complaint against Minister of Interior Magdy Abdel Ghaffar and Cairo’s security chief due to the harassment of journalists and alleged attempts from “regime supporters” to storm the Press Syndicate building during Monday’s protests. Protestors had designated the Press Syndicate in downtown Cairo as one of three main locations to demonstrate against Egypt’s recent decision to cede two Red Sea islands to Saudi Arabia, but police forces mobilized early on Monday to block access to all planned locations. Riot police also used tear gas to disperse a series of protests throughout central Cairo, including Al-Nahia near Mohandiseen and Mesaha Square in Dokki, as protestors struggled to gather amid the heavy security presence. However, pro-regime demonstrators were allowed to gather in several locations – including in front of the Press Syndicate – to show their support for President Abdel Fattah Al-Sisi and to celebrate Sinai Liberation Day, which fell on Monday. According to the statement, members of the syndicate were also barred from entering the syndicate building despite showing their credentials to the security forces that surrounded the headquarters and surrounding streets. The statement went on to condemn the arrest of tens of journalists prior to the scattered protests and throughout the day on Monday. Head of the syndicate’s freedoms committee Khaled El-Balshy told state-owned Ahram Online that a total of 43 journalists – including five foreign journalists – were detained on Monday while covering the protests, with seven remaining in police custody on Tuesday. According to the “Freedom for the Brave” campaign, a total of 239 individuals were arrested during Monday’s protests. Following these arrests, the Committee to Protect Journalists (CPJ) issued a statement calling on Egyptian authorities to “immediately cease detaining and harassing journalists.” CPJ had previously named Egypt as the world’s second-worst jailer of journalists. 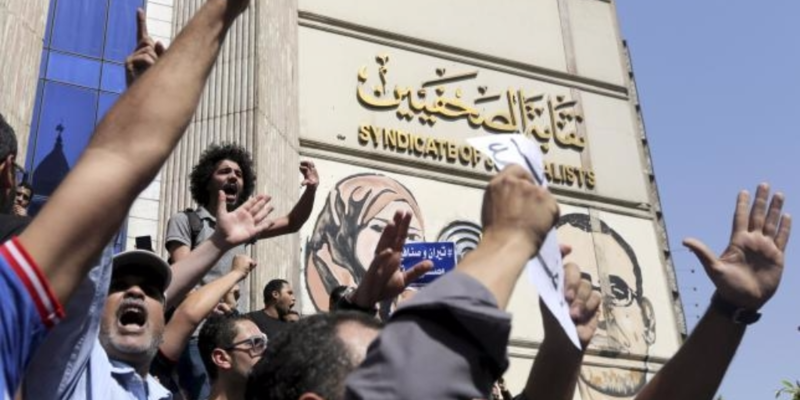 “The Press Syndicate warns the country’s relevant authorities that it will not stand with its hands tied in the face of these shocking procedures, whether from the security forces that stood idly by in the face of attempts to storm the syndicate building and assaults against journalists, or from the herds of thugs that gathered and moved around with frightening freedom, with evident police protection in front of the syndicate building all day,” the statement went on to say, adding that these incidents were reminiscent of the now-dissolved National Democratic Party’s tactic of hiring convicts to quash public protests. A press conference will be held at noon on Thursday, during which journalists who were subjected to harassment on Monday will give their testimonies. Following the press conference, the syndicate members will march to the Prosecutor-General to protest these violations and to present their complaint against Egypt’s interior minister and Cairo’s security chief.